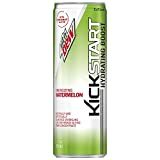 Mountain Dew Kickstart Hydrating Boost is a coconut water version of Kickstart. It comes in a smaller can than original Kickstart and has less caffeine. Sugar content: 14 grams (per 12 ounces). 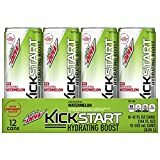 How Does Mountain Dew Kickstart Hydrating Boost Compare? 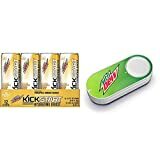 Mountain Dew Kickstart Hydrating Boost contains 5.67 mgs of caffeine per fluid ounce (19.16mg/100 ml).